This topic answers the most common questions about getting your Trumba® calendar spuds to behave the way you want them to on your site. When I embed my spuds in a secure page they don't display. Why? Can my spud display a filtered view or specific search results by default? My calendar won't display when site visitors select a tab, drop-down, or other hidden section. Why don't my spuds display on my WordPress blog? When I click an event in a spud, it jumps to trumba.com. I want it to jump to the calendar page on my own site. The calendar is wider than the maximum width for my page's content area. Nothing happens when I click a date in the Date Finder spud. Why is the Date Finder spud out of sync with the calendar? I embedded an Upcoming Crawler spud but the events scroll too fast. Can I control the speed? Can I publish the same spud on multiple web pages with different settings or styles? Do I have to load the same script file, spuds.js, with each spud? Can I create a link to allow visitors to subscribe to my scheduled email or add a particular event to their calendar? Tip If the question you have is not included in this list, please visit our Product Support Forums, where many more spud questions are answered. When browsers display content on secure (https) pages, they check to make sure all of the content on the pages is also secure. Because the URL in that code begins with http rather than https, the browser interprets the spud content as potentially insecure. Microsoft Internet Explorer® displays a message at the bottom of the page. Google Chrome adds a shield icon to the right side of the address bar. To make sure that visitors to an https page don't have trouble displaying your spuds, remove "http:" from your spud script code (in the spuds.js section), such as in the top example. I'd like to know a little more about the spuds.js code. Sure. If you use custom fields and/or organize your content by owning calendar or folder, you can use filter views to pre-filter spud content. For example, suppose a university calendar uses an "event sponsor" custom field to indicate which academic department sponsors each event. This makes it easy to set up filtered views by department. Each filtered view consists of a collection of spuds pre-filtered to display only one department's events. These pre-filtered spuds can then be embedded in each department's home page. To learn more, see Filter views. Use a call to the $Trumba.addSpud() method to load the calendar spud when a viewer first displays the hidden section. For example, in the case of a tab control, use an event handler to make the call. Provide the ID of the div (the tab, drop-down, or other section) that contains the spud by including the spudId argument in the $Trumba.addSpud() method. Refresh my memory about how spud code works. For a demonstration of how to display a calendar in a tab, open one or both of the following files and view the commented source code. If you try to enter spud code into a post on a WordPress blog that is hosted by WordPress.com, the only thing that displays in your blog is the text for the spud code. Trumba customers who host WordPress have successfully included spuds in their websites using the Enhanced Text Widget plugin. You can download this plugin from WordPress.org at https://wordpress.org/plugins/enhanced-text-widgets/. By default, event links in promotion spuds point to the version of your calendar hosted on trumba.com. You can easily change where event links point by putting the URL for your own calendar page into the Calendar Address field in Publish Settings. Updating the Calendar Address field affects more than just spuds. It also means that visitors who click event links in your calendar emails and RSS feeds will jump to the calendar on your website. Copy the URL for the page on your website where the main calendar spud is embedded. Tip Be sure to include the http:// portion of the URL. 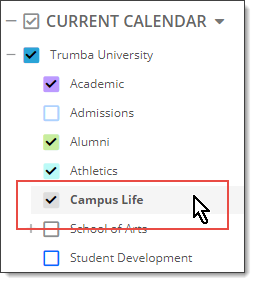 In your Trumba account, confirm that the published calendar you want to update is selected. As shown here, the name of the selected calendar (Academic) is in bold type and it has a dark black check mark. To select a calendar, click its name. In the Publishing Control Panel, on the Publish Settings tab in the Publish Settings section, click Edit Publish Settings. For Calendar Address, paste the URL that you copied in step 1. Tip The calendar address URL must include http:// or it won't work. To see and test how promotion spuds respond to your calendar address updates, return to the Publishing Control Panel. Click the Promotion Spuds tab. The spud script now contains the teaserBase argument. As shown below, the value for that argument is the URL you pasted into the Calendar Address field. To test where each promotion spud's event and other links take you, click Preview. Copy the updated promotion spud script and replace the original script on your live website. The Multi-day template requires a width of nearly 800px and currently behaves a little differently than the others. If your calendar uses this template, and you want it to fit into a narrower space, you need to take the code above one step further. Why is the Date Finder out of sync with the calendar? Expecially when you use the previous and next buttons to page through the calendar, it's not unusual for the Date Finder and main calendar to appear to be out of sync. Calendar view settings control the number of events per page and how those events are grouped. I need more information about paging and grouping settings. The Date Finder includes dates from the previous and next months and the last and first events in a month don't always fall on that month's first or last day. Tell me more about the Date Finder. The following image shows a Date Finder spud beside a main calendar spud displayed using the List calendar view. Tell me more about calendar views. The two spuds appear to be out of sync. The Date Finder shows August while the events listed at the top of the main calendar take place in July. 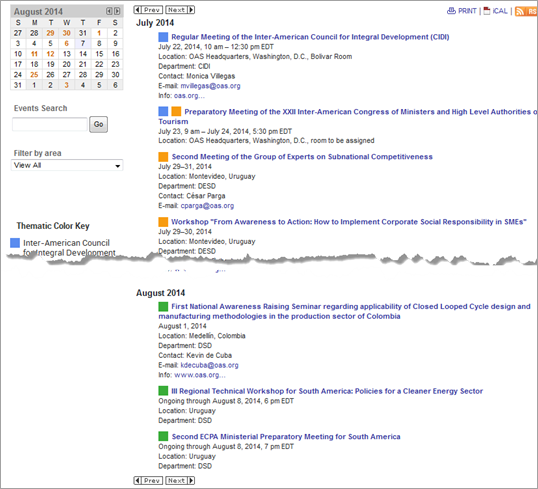 However, because of the List calendar view's paging and grouping settings, the calendar also displays August events. Display ten events per page. This organization promotes a relatively small number of events so both the July and August groups appear on the same page. Use Smart paging, which means that the calendar view shifts the number of listed events to keep entire groups together. For example, if seven events occur in July and five in August, a total of 12 events would be listed to keep all events in the August grouping on the same page. In this case, the Date Finder and calendar are not really out of sync as the Date Finder reflects the August events' display. The interrlationships between calendar view settings and the Date Finder means that you can't prevent the two spuds from occasionally appearing to be out of sync. Given the primary purpose of the Date Finder spud, it shouldn't cause visitors any problem. The Date Finder is not merely a thumbnail reflection of the main calendar. Instead, it's a navigation tool. Visitors can click a date to quickly navigate to that day or month (depending upon the calendar view). If you turn on Date Finder popups, visitors can also hover over dates to pop up a list of that date's events. By clicking an event title in the popup, visitors display the event detail page. The Upcoming Events Crawler spud code contains a Speed variable that you can modify to control the speed with which events scroll. The default value is 35. After you paste the code into a webpage, you can control scrolling speed by changing the Speed variable's value. To speed up scrolling, replace 35 with a lower value. To slow down scrolling, replace 35 with a higher value. Can I publish the same spud on multiple webpages with different settings or styles? With both promotion and control spuds, you have the option of creating multiple versions of the same spud for use either on the same or different webpages. Each version can use different settings to meet your needs. Why would you want two configurations of the same spud? Suppose a public library places on its home page a Vertical Crawler promotion spud that displays the next ten events. The library also promotes the next five events in its lobby using the same Crawler spud formatted for digital signage. Tip If you want to copy a spud and maintain exactly the same settings and styles, you can clone the spud. Learn more. Add a promotion or control spud. Add the same spud again. On the Edit Settings... page, under Spud Configuration Name, you see the default name, SpudConfig2. Replace that default name to make it more meaningful. For example, if the library mentioned earlier created a second Vertical Crawler spud for use in digital signage, the library might name the spud configuration digital_signage. Meaningful naming makes it easy to keep track of each spud's unique purpose. Customize additional spud settings as needed. Embed the code for each configuration of the spud wherever you want to use it. Each copy of the spud shows events from the same calendar using the specific settings you selected. Include the call with the first spud that appears on the page. Leave it out for remaining spuds. For example, suppose your webpage includes a Date Finder promotion spud at the top of the left column, followed by the View Chooser and Search control spuds. The Main Calendar spud appears on the right. The only spud that must include the spuds.js script call is the Date Finder. Put this line of code in the <head> section of your page and then omit it from each individual spud's code. The script above runs a file called spuds.js. The code in this file oversees communication among spuds on a page and between spuds and your source calendar data on the Trumba server. Without this code, the individual spuds cannot function. Although you should use this script only once on each page that contains spuds, the code appears with all spuds in the Publishing Control Panel. This is because any of the spuds can function as the only spud on your page, and the code must appear once. Running it multiple times does not harm anything, but it can affect performance. For the second or subsequent spuds on a page, do not copy this part of the code from the Publishing Control Panel.